I completed my first year at Ohio University in the beginning of May, so I had two weeks break prior to my Fulbright Enrichment Seminar in Philadelphia. Even though I was tired after my long trip, I was extremely excited to meet my fellow Fulbrighters. 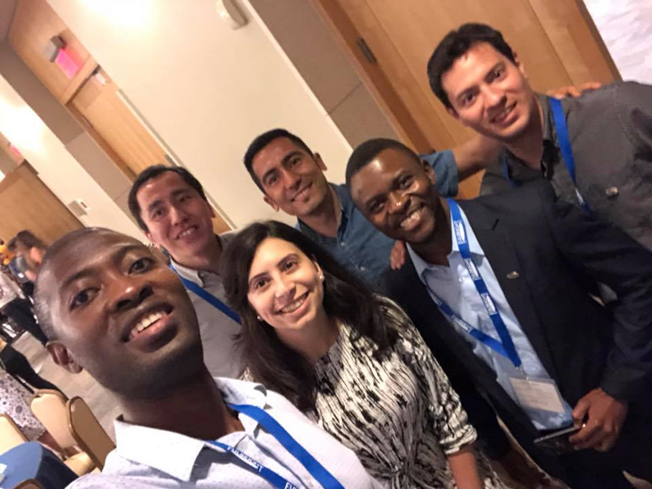 The Enrichment Seminar provided an opportunity to meet 127 awesome and inspiring individuals from more than 50 countries around the world, with the purpose to learn about the impact of big data on the public good. 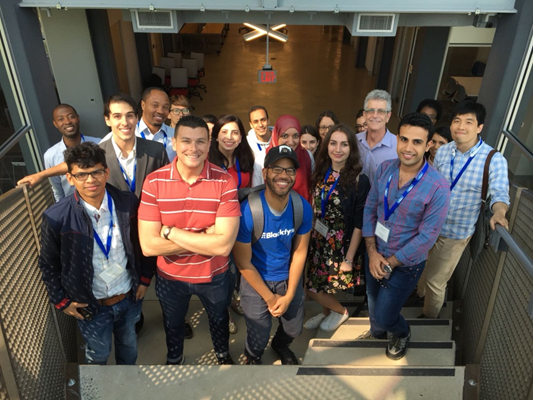 Our seminar focused on big data and our group featured diversity among the participants including a wide range of fields of study, home countries, and universities across the United States. I was also pleased to have a reunion with some friends from my pre-academic program that I attended last year at Kansas University. The program invited several speakers from academic and professional backgrounds to discuss big data and its application from their perspective and they conducted a thought-provoking discussion afterwards. The examples that were discussed were from different fields, including how big data can be used by the police to enforce public safety or for determining which houses require renovation, especially in a historical city like Philadelphia which is full of historic houses and buildings. Furthermore, the presenters explained that waste treatment can be handled more efficiently and effectively through big data. Personally, one of the topics that I was most interested in was public health since that is related to my field of study, especially how big data can improve public health in the communities. Even with all the benefits that utilizing data may generate, the presenters warned that big data has its cons. For example, it may be inaccurate and result in bias or misleading information, such as when the presenters explained how it creates racial bias in policing. However, big data is a tool that can still be utilized in the development field as it can help to develop indicators and assist in assessment. The examples that were discussed were mainly implemented in Philadelphia, and I was impressed to see the enrichment seminar focused on these applications and did not only talk about abstract ideas. Including real success stories and even some lessons of how big data may be applied through a better approach enhanced the program. After a large-group discussion, we were split into small groups to visit organizations that apply big data through their work. I chose an organization called BlackFynn, which operates in the health sector. I was so excited to visit the organization and learn more about how they utilize technology and data to support healthcare providers and to provide better health services for communities. A couple of employees presented about the organization and the work they’ve accomplished with the use of big data. I was surprised that Philadelphia has all types of restaurants from many cultures. Philadelphia is a beautiful melting pot and a great representation of the diversity in the United States. I went to a Turkish restaurant and it was a wonderful experience. In addition, it was Ramadan, which is the month when Muslims are fasting so many of the Muslim students could not eat until after sundown. 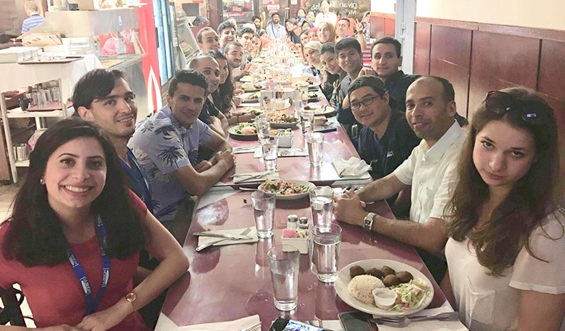 As a Christian from the Middle East, I am used to seeing people fast, but it was a new experience for many other Fulbrighters. It was nice to share dinner together, as there is nothing that can bring people closer than food. We bonded and as time passed I got the chance to meet more people. On Saturday, we had a wonderful opportunity to give back to the community through volunteering. We were split into different activities around the city. 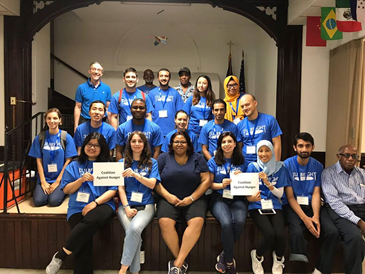 Since one of the causes I am passionate and have been involved with previously in the United States and abroad is poverty and hunger, I chose to volunteer with the Coalition Against Hunger team. We went to a local church that serves community lunches and hands out donated clothes. Everyone had a few tasks to take care of, such as helping individuals finding clothes that fit them and preparing and serving food. Finally, we all presented about our home countries before an interactive Q&A session. During the evening we explored the beautiful city of Philadelphia and enjoyed the rich history of “The City of Brotherly Love.” It was the perfect city for big data for a better world, where we are all from the humanitarian family. The three days of the seminar passed by quickly and were not enough to meet and get to know everyone, but I made many new friends and learned about new concepts that I can apply to my field. 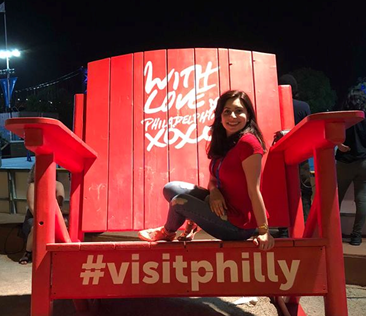 I really loved Philly and I recommend visiting this beautiful city that has everything, especially a unique culture, history, art scene and more! Philadelphia also has the Liberty Bell, Independence Hall, the first U.S. hospital, and the first medical school. I was impressed to learn about the important role that Philly had played in the U.S. history (especially the history of public health since that’s close to my heart/interests). Finally, it was nice to visit the hometown of the Eagles who won the Super Bowl this year! Yes, that’s one of the American experiences you can’t miss. After the seminar, I traveled to Washington D.C. where I am about to begin my summer internship and I can’t wait for the adventures to continue during the rest of my Fulbright experience. Dareen is from the West Bank and is a second year Fulbrighter. She is studying International Development Studies at Ohio University. 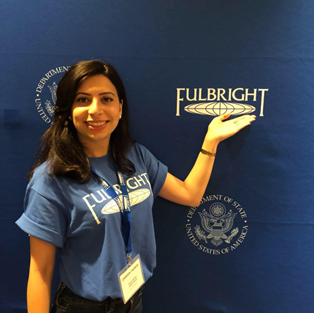 You can follow her Fulbright journey here.